[ARCHIVED THREAD] - AR15 or M1A? I've got a Colt AR15, I like it, but I want something old school, heavy with a lot of power. So it brings me to an M1A. I'm looking at one of the Springfield Standards with composite stock, I'm looking for suggestions. I'm not paying money for a match sub moa @1000 yards rifle, so don't suggest the White Feather. Or should I just get a new AR15 as well. Unfortunately, I can't follow arfcom tradition of getting both. get the FAL, mags are far less expensive than the M1a, just as accurate as the standard M1a, and an overall better value if you ask me. neither, get a FAL while you can. I have Ar's, FAL's, and M1A's--If I had to grab one and go it would be one of the FAL's. But my only answer to a terrible dilemma like this was to get a couple of each. I love my springfield M1A. Like you said, you'll get another AR15 down the road. (like I did) but I really enjoy having an M1A in my closet. 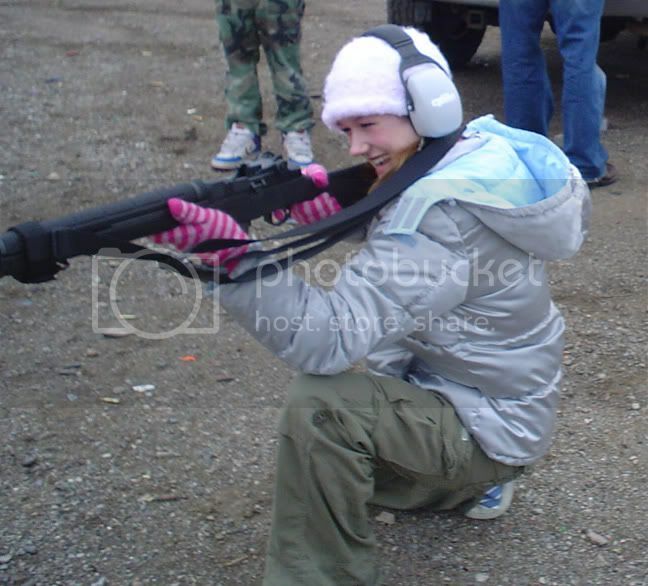 A lot of fun to shoot, no offense - but I thought it was more fun than the FALs that I shot. That's why I chose it. AR10, or FAL. Or a rifle bult on one of these forged M14 receivers. I have a loaded Springfield that I bought years ago. Never had a problem with it. The sights on an M1A are much nicer than any FAL that I have ever shot. I would take an M14 style rifle over an FAL anyday. As for the mags, you can buy them cheap now that the assault weapons ban is gone. 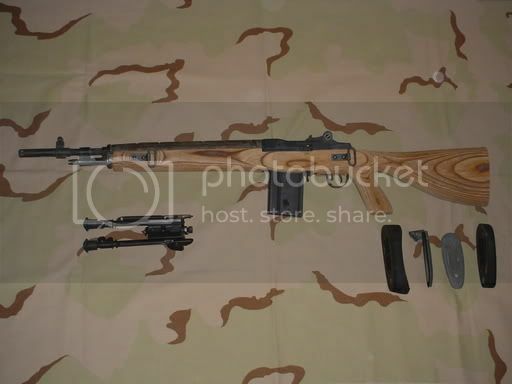 I am giving serious thought to the LRB arms one with the forged reciever and all USGI parts. You wont go wrong with Fulton Armory or The Ammo Man. Aparently not, as the majority so far has recommended an FAL. I would go with a FAL. It's a good reliable weapon, and the mags are much cheaper than the M1A. The rifle itself is generally cheaper too. If you are going on the cheap, I'd have to say get the Fal. I own ARs, M1As and Fals. In all honesty, the Fals do just as good a job as the M1As, I just have a thing for the M1/M1A. DSA STG58 blows the SA M1A's out of the water in my opinion. And it even comes with a bi-pod! You would own a peice of history, while spending less money. Nuh uh! SA M1A blows the STG58 out of the water! Since you already have a Colt AR-15, why not step up to a .308 and seriously look at a M14/M1A. Fal, hands down winner. Mags are $5 too. That's one thing I've noticed, why the hell are M1A mags so expensive? 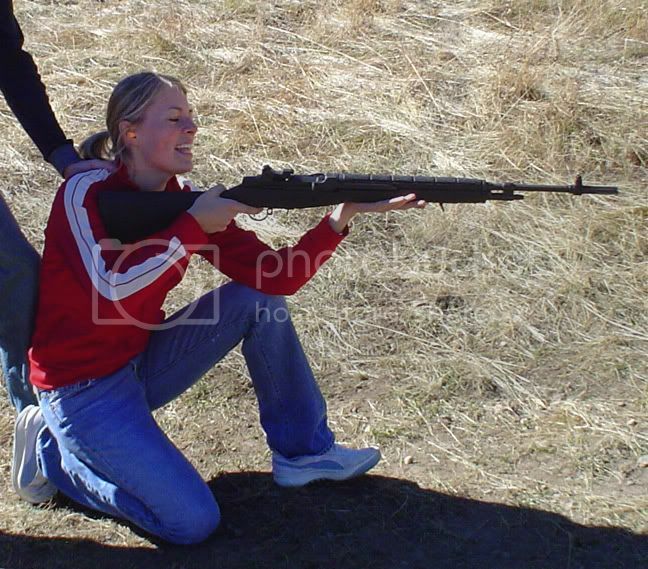 Shouldn't she shoot with her eyes open? That's how I was taught anyway. I say fal also, far greater range of ammo you can shoot with the adjustable gas port. I got one a few weeks ago and it is more accurate then I am. Or get a Garand, and shoot cheap also. It has to be an AR.15. It's not M1A.com or Pie.com. I wouldn't mind joining Pie.com. I vote Garand. Mine is the one rifle that I will not part with. Good advice. But right now, FALs are probably the best value. Getting an M1A built off of USGI parts and the required 15-20 magazines is cost prohibitive now. But I would never sell my M1A. 308 power plus it's a better accuracy platform than an M14. If you go the AR10-A2 route, it comes with better sights than either the FAL or the M14. M1A- no pistol grip, no thanks. You can easily find surplus Taiwanese GI mags (every bit as good as USGI) for $14 each. Yeah, I know that's still X2 what FAL mags are, but still it is hardly expensive. Get an M1A, you won't regret it. I have an AR and an M1, next on the list is an M1903A3 and an M14 clone. Agree, get a Garand first. Get the real McCoy before they are gone. I recommend a semi-automatic only M14 type rifle but that's no surprise. You don't have to worry about buying parts for it to bring it up to speed like you would have to with a new M1A. Before the thread was moved there was a poll... poll coming! I like my M1A best! an FAL is a nice MBR, and it's in 7.62 so I "obligated" to own it. Hey...where did you get that stock...??? I need a new gun when I get back from Korea.. I could take my old M1A and give it a nice new stock..
Get a percision AR15 upper for the rifle you have, it'll be cheaper and you won't have to familirize yourself on an entire new platform. It will able to reach out and touch targets with ease, while not at 1,000 yards like the .308. You could stockpile on one type of ammo for your battle rifle, and a percision round for your DMR. But in the end you could use either types of ammo in either rifle, plus you could use the same magazines, and parts. And, it's sufficiently similar to the AR15 you already have that maintaining it will be simple. You already "know" the weapon. I had an M1A and a FAL. I sold off the M1A. Why? I like the pistol grip firing position, and I wasn't about to spend hundreds of $$ for a Sage, etc. stock. Basically, since I got my FAL, I haven't shot the M1A. Also, since you haven't specified primary duties of the rifle, it's kind of hard for me to vote. While I much prefer the M14 type to the FAL , I'd say buy a FAL now since it's going to be harder and harder to find a lower priced FAL in the future with all this ATF bs of late.You'll be able to buy M14 clones for many moons to come.